You can, indeed, have your UI cake, or at least your UI eye candy, and eat it, too. And sometimes the easiest way to accomplish this goal is to relegate the two different tasks to two different online locales. The netlabel Pocket Fields, for example, is lovely, as is often the music that it releases. Each page on its Tumblr-powered site (pocketfields.tumblr.com) for a given album displays a slender vertical band, and allows a single MP3 to be streamed as a teaser. There is a link, then, to the archive.org hosting service, where a Zip archive of those MP3s is resting, waiting to be downloaded, unlocked, and listened to. But, just about every archived sound object at the latter site has a public face, which means that after, say, enjoying the single Tumblr-based stream off Jonas Ruchenhever‘s Machines & Corners, you can proceed to archive.org and listen to them in full, one at a time, before deciding whether or not to download all 98.3 megabytes of them — or select them a la carte. Either way is recommended, but the album definitely is intended to be listened to as an album. The tracks range from metallic drones to evasive percussion, and the collection revels particularly in these haze-like zones where the ear listens through a wavering sound. But there are beats and disruptions as well. For all the slowly layering, sinuous tones of a “Corner V” (MP3), there are the complex industrial-tribal cross-patterns of a “Machine IX” (MP3). This contrast is at the heart of the collection, whose 10 tracks are almost evenly divided between these two types, each track siding with either the “Corner” or “Machine” tag. 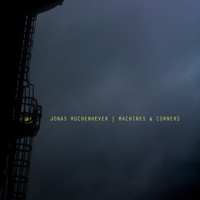 More on Ruchenhever, who is based in Belgium, at jonasruchenhever.be.